Dr. Deborah Levine, a professor of radiology at Harvard Medical School who has studied Zika but was not involved in either study, said there would most likely be other waves of children whose brains were affected by the Zika infection, but not severely enough to be noticed in their first year. In the new study, doctors at two clinics in the northeastern Brazilian states of Pernambuco and Ceará described the cases of 13 infants who had tested positive for the Zika virus. In 11 of the babies, brain scans taken days or weeks after birth showed significant neurological damage, including improperly formed brain areas, excess fluid in some places and abnormal calcium deposits, or calcification, which probably resulted from brain cell death. But the size of their heads, though small, was not small enough to be considered microcephaly. So doctors monitored their progress as they grew. Dr. Vanessa van der Linden, another author of the study and a neuropediatrician at the Association for Assistance of Disabled Children in Recife, Brazil, where most of the babies in the study are patients, said the type of brain damage in the babies who later developed microcephaly “presented the same pattern, but less severe” than those with it at birth. The babies in the study published this fall also appeared to have a pattern of similar, but less severe, brain damage, said Dr. Antonio Augusto Moura da Silva, of the Federal University of Maranhão and an author of that study, which was published in Emerging Infectious Diseases. He and his colleagues studied 48 babies with brain abnormalities in the northeastern state of Maranhão, identified six babies who did not have microcephaly at birth, and found that three of them later developed it. It could also be the result of the immune system responding to the original Zika virus infection. Dr. Moore said that another possibility might be that there was still some infection that continued to damage the brain. But she said that seemed less likely, given that follow-up tests for Zika virus conducted on seven of the babies did not find evidence of active infection. The oldest babies in these studies are only just over a year old, too young for researchers to identify cognitive problems or delays in skills like speech. But some deficits are clear: Many of the babies had serious physical deficits tied to neurological damage, including overly tense muscles, muscle weakness and the inability to voluntarily move their hands. Still, unlike many babies born with microcephaly, most of the 13 in the new study had social interaction skills like smiling and making eye contact. And eight of them had good head control, an important skill for developing the ability to sit or walk. While cautioning that the study involved too few cases to make generalizations, Dr. van der Linden said that it appeared that most of these babies had good eye contact because the damage was less severe in brain areas involving vision than it was in areas involving motor skills. Dr. Marques said that head control, the ability to lift and support the head without help, in babies with microcephaly was “quite rare.” Having a social smile and eye contact is less rare, he said, depending on the type of visual damage and on whether they receive enough visual stimulation to strengthen their ability to use their eyes. One baby, a boy, had no anomalies at birth. His limbs looked normal and his head size was proportional to his body, Dr. Moore said. But brain scans soon after birth showed excess fluid and abnormalities in his cortex and corpus callosum, which separates the two hemispheres. At 11 months old, he had microcephaly, and also epilepsy, difficulty swallowing, involuntary muscle contractions, and muscles that were too stiff and restricted his movement, she said. Another baby had a sloping forehead and slight depressions in the front of his head at birth, as well as similar types of brain damage, apparent on scans, Dr. Moore said. By the time he was 1, he had developed microcephaly that was among the most severe of the babies in the study, and had muscular and swallowing problems. But he also had good eye contact, researchers reported. In six of the cases, the mothers reported having a symptom of Zika infection, a rash, between the second and fifth months of pregnancy. That supports other evidence suggesting that babies born to mothers who were infected late in the first trimester suffer the most serious effects. 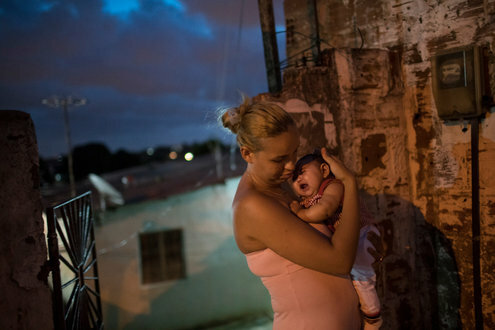 But since there are no symptoms in 80 percent of cases of Zika infection, it was unclear when most of the women were infected, and researchers are still unable to say whether the virus is more damaging to babies if their mothers experience symptoms. A version of this article appears in print on November 23, 2016, on page A9 of the New York edition with the headline: Zika-Related Microcephaly Is Found in Babies Months After Birth.